How does the old adage go? If you don’t document it, it didn’t happen? 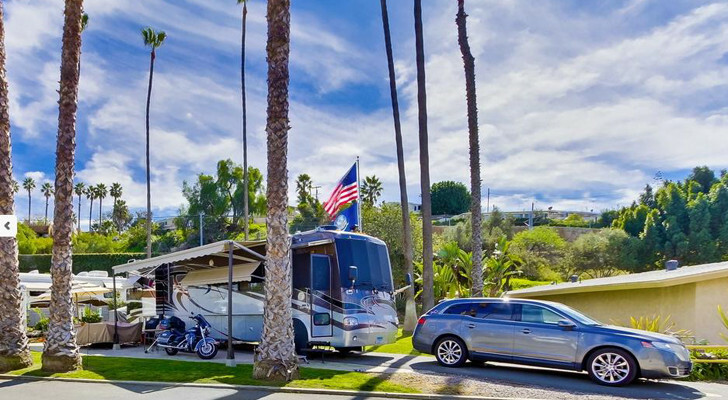 RVers seem to be the type of people who love to document where they have taken their RV. One of the most common ways to do this is with a map where each state, province, national park, or territory has been ticked off. Whether you just drove through Kansas or actually stopped overnight to enjoy the lights in Wakeeney is up to you, but there is something so satisfying about checking another glorious state off the map. 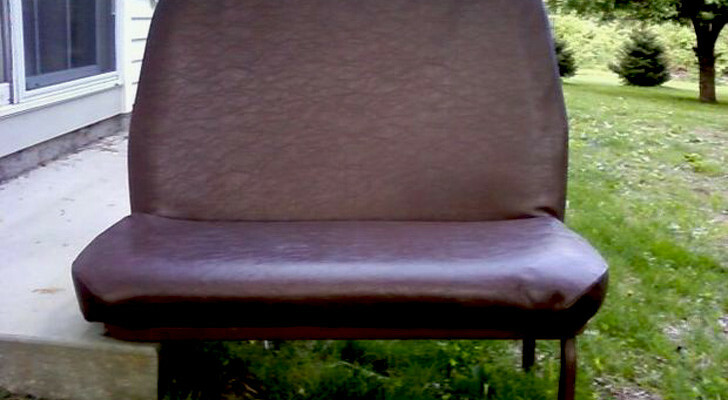 Most of the time this is done with those typical vinyl maps you see on the sides or in the back windows of rigs. 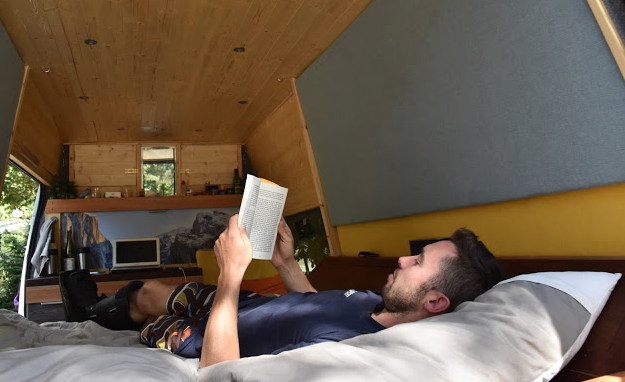 While this is a fun way to show off your travels and spark conversation, there are several more creative ways to show off your tour of the nation. 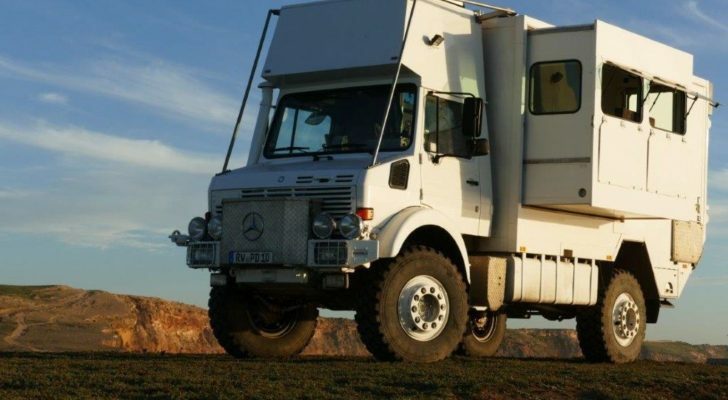 From embroidery to beer cap scrapbooks, have fun documenting and sharing your RV trek with family and strangers. 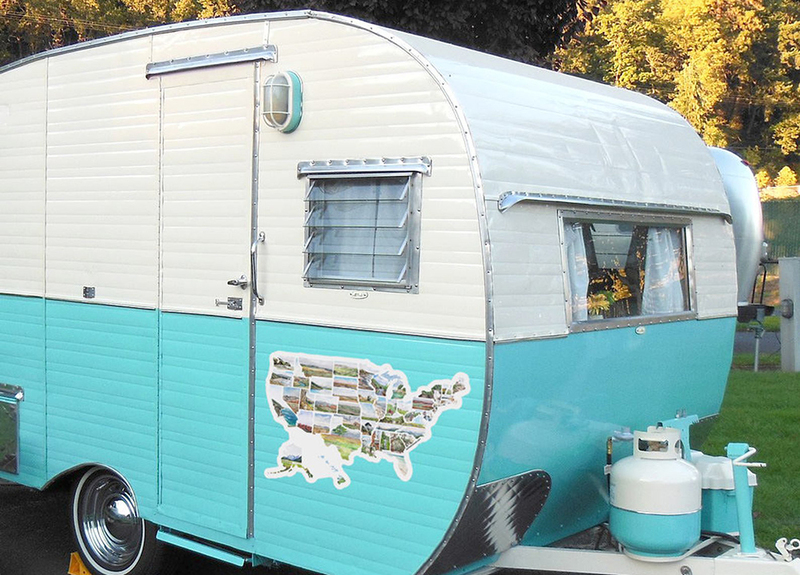 The owners of Rita the Burro have a fun and unique way to document their travels in their 1980 fiberglass trailer. They have a small, but effective cross stitch embroidery hoop with a map of the US. They use different colored threads to fill in each state. 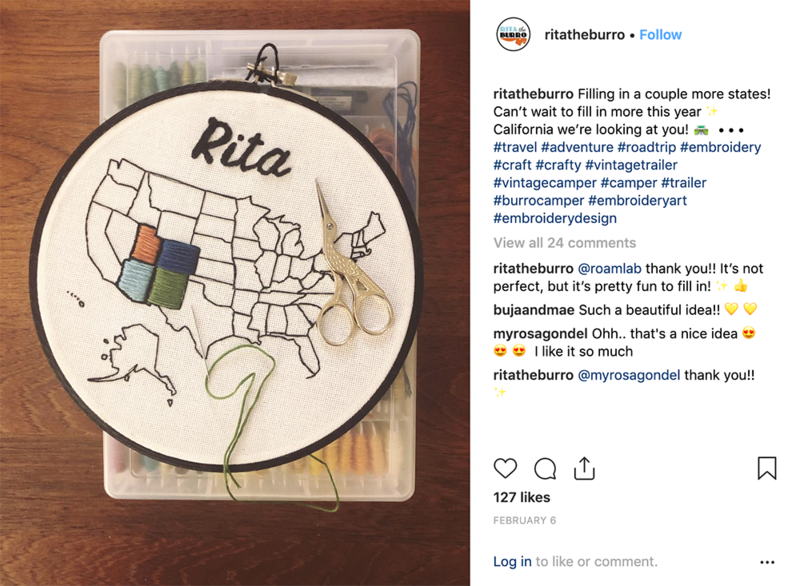 If you are not much of an embroidery expert, a US map template is available on Etsy. 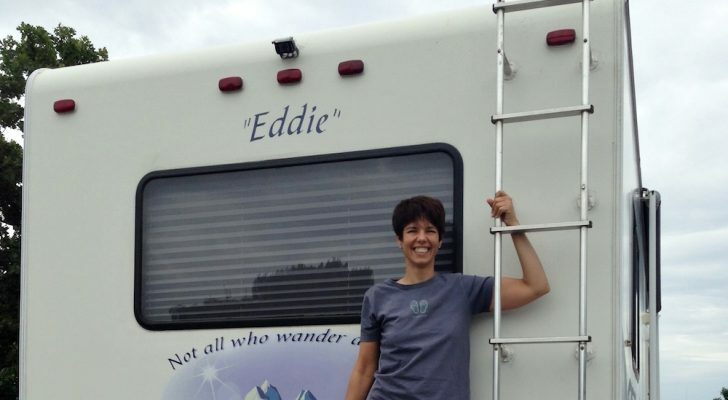 Decals are probably one of the most popular ways to document RV travels. 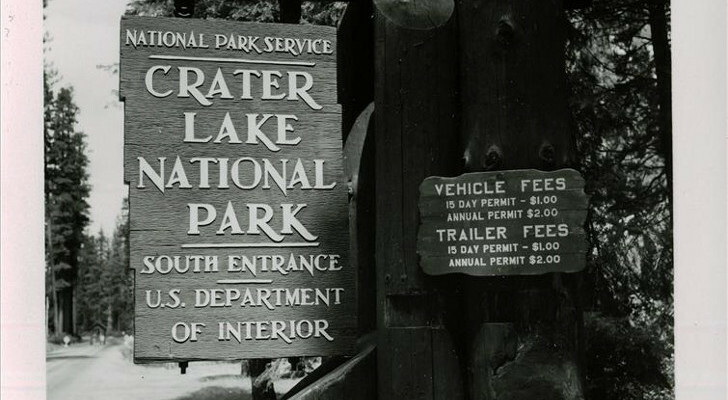 State or park stickers can easily be picked up from a gift shop and displayed on your camper door, window, or bumper. Another fun way to list visited states is with unique visuals. 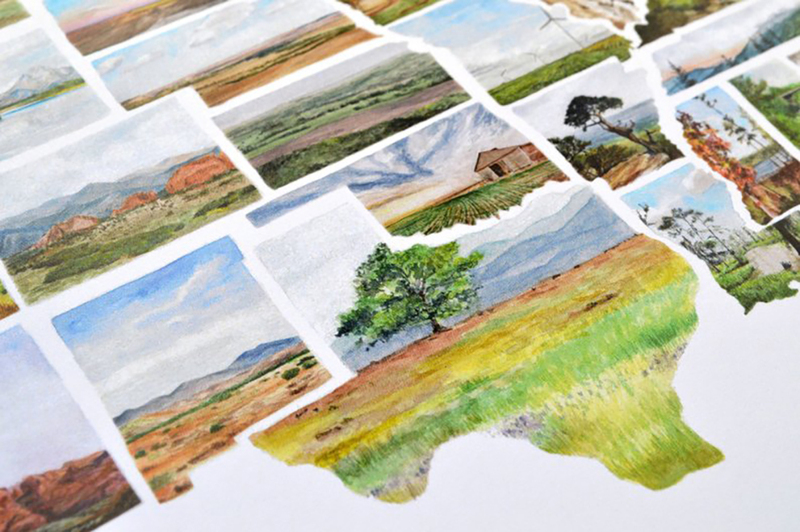 This US travel map from TheNapTimeArtist on Etsy includes beautiful illustrations that represent all the US states. From rolling Pennsylvania hills to the Florida shoreline, these little pictures create a real work of art. If you are an artist in your own right, maybe download and print out a free paper map of the US and create your own illustrations of a journey through the states. 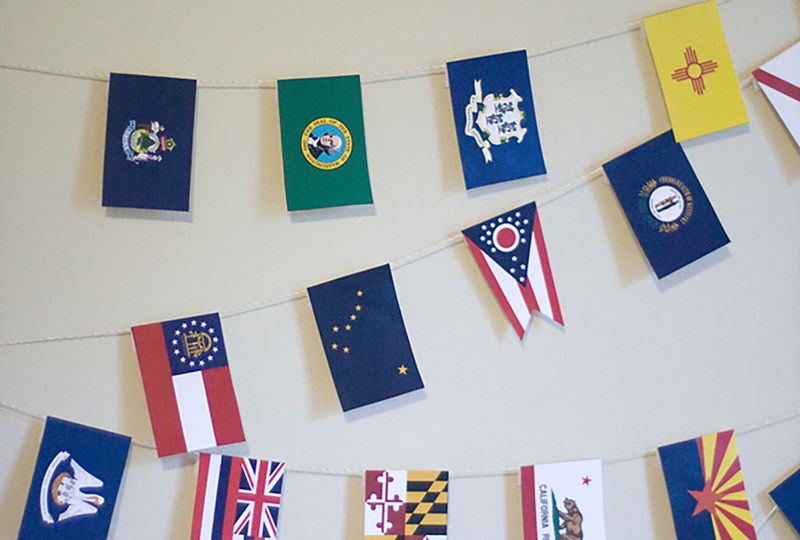 Show your national pride and add a trivia aspect to your journeys by displaying the flags of each state you visit. Our Adventure Story has printable flags available that can be cut out and hung on a string for a colorful travel account. You can also print out free state flags from other websites. If you get a thrill from a simple scratch-off lottery ticket, you’ll love these scratch-off maps. Each time you travel in or through a state, you can grab your quarter and scratch off another location. These maps can be found on Amazon and Etsy and this Landmass map even has one with all the national parks listed. Just about every state has at least one unique beer, wine, or soda. Part of the fun of traveling is tracking those items down and drinking them. 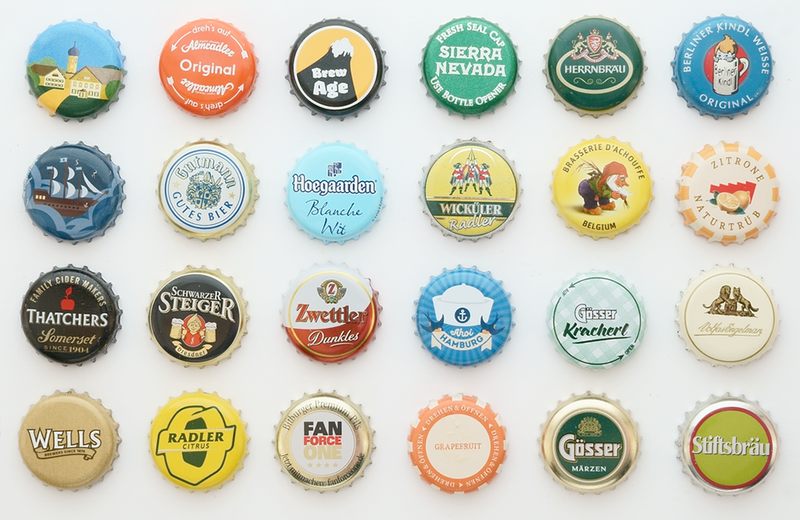 Save the beer or wine label or the soda or beer cap in a variety of ways. Create an inexpensive scrapbook to hold the labels or put the beer or soda caps in a frame shaped like the US or even in a side table or serving tray. 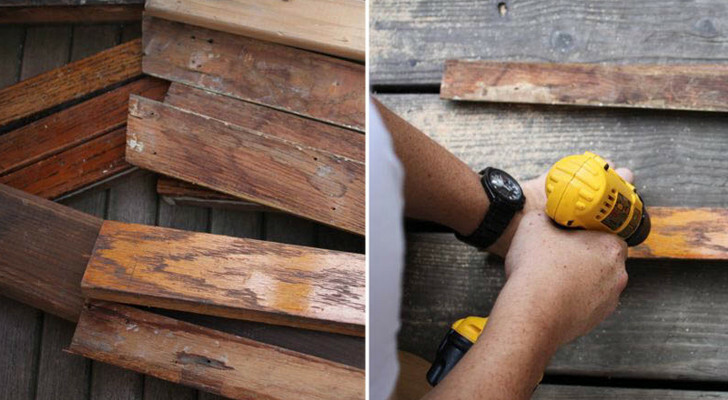 Bar Top Epoxy has a fun tutorial on how to make a bottle cap table top with epoxy resin. Dedicate a small part of your RV as a place to display all or a revolving segment of state postcards. They can be hung on the wall in a variety of ways. 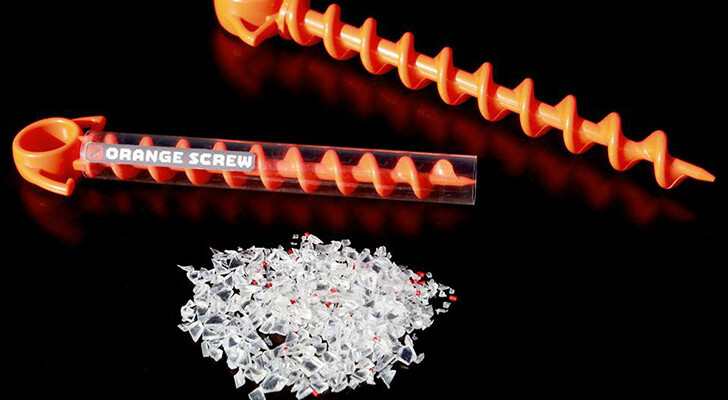 Use 3M Command Hook Spring Clips to clip postcards to a wall without any damage. 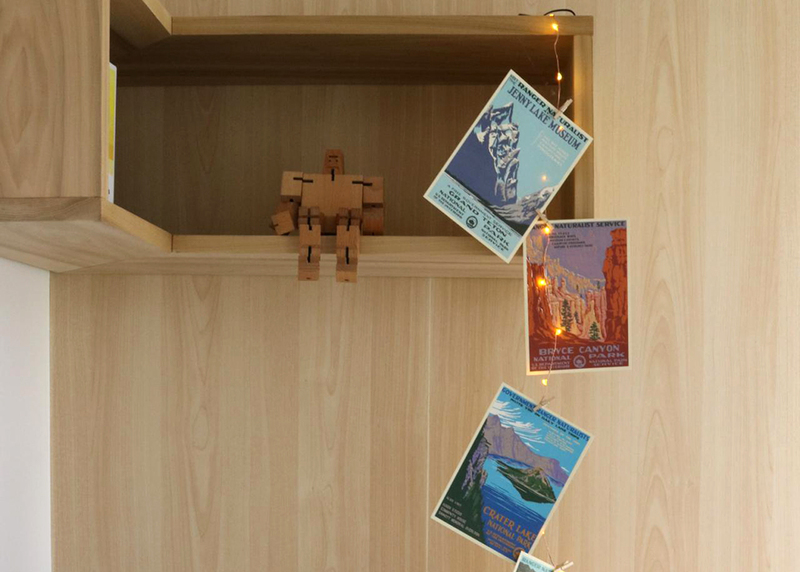 Use a clear hanging shoe or a jewelry organizer to hold national park postcards or clip them to light string with small clothespins. What’s nice about postcards is that they can be specific to a location rather than just a state or Canadian province. 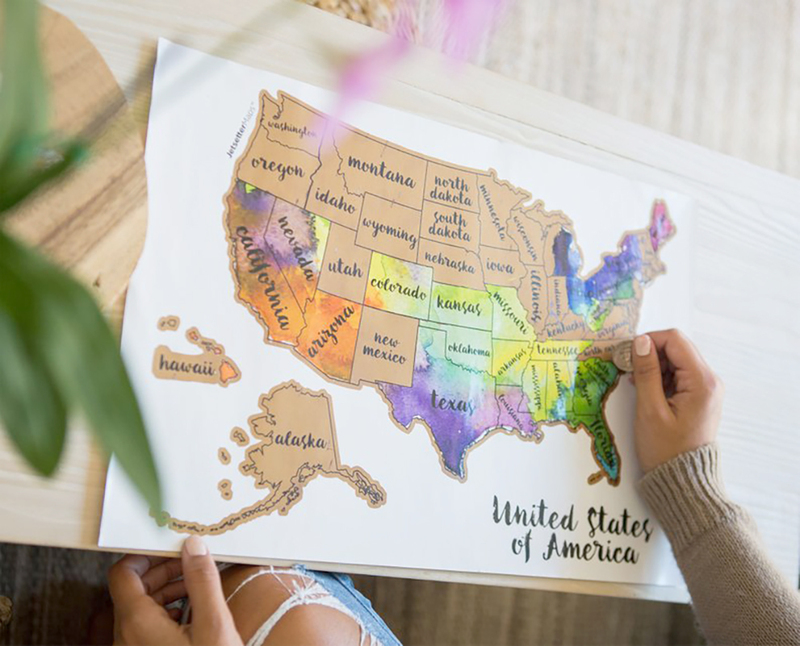 If you want to keep your state documentation cheap and simple, there are free and inexpensive map templates available from artists on Etsy and Vecteezy. 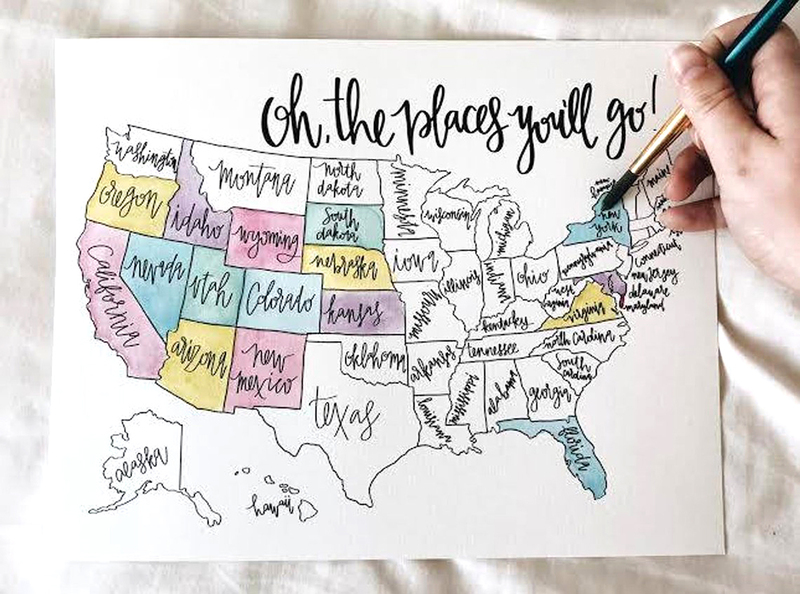 Download and print on your paper of choice and use watercolors or markers to color in each state as you visit. The colors can even match the main colors of each state flag or landscape colors. How about a warm red for Colorado or Pacific blue for California?